Eyebrows are big business in the cosmetic industry and over the past decade, we have obsessed over creating the perfect eyebrow look. Celebrities like Cara Delevingne and Lily Collins have ignited a desire for thicker, fuller brows that frame the face and create an ideal aesthetic. Long gone are the days of very thin, over-plucked brows and now it is the bigger the better. Ombre microblading has become a lifesaving technique for anyone wanting to achieve a fuller brow after years of over-plucking. This treatment uses tattooing techniques to place pigment within the natural brow hairs that mimic them, fill unwanted gaps and create a much more enhanced, natural shape. 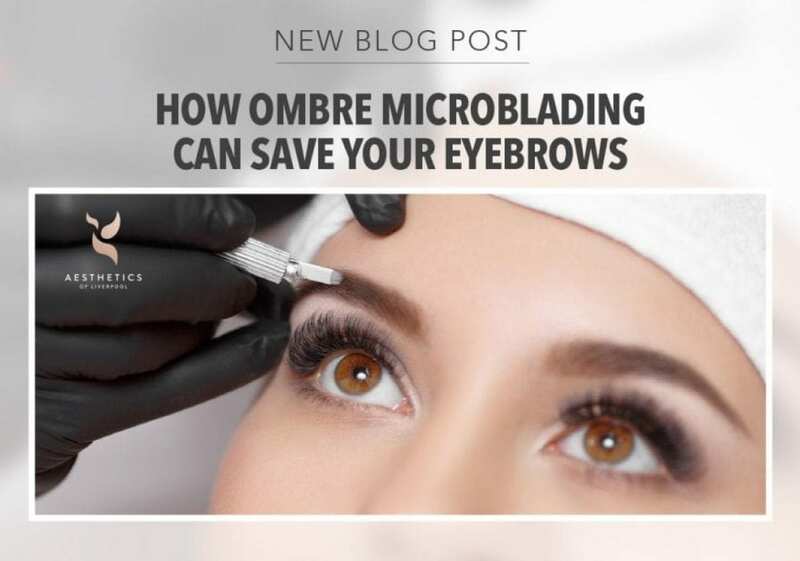 We offer our very popular microblading services at Aesthetics of Liverpool, but we understand that there is still some confusion when it comes to the question of “What exactly is microblading and how long will it last?” The eyebrow trend for big, beautiful brows is here to stay, and ombre microblading provides a longer-lasting solution to the problem of thin, unshapely brows. Microblading is essentially an alternative form of tattooing; however, the pigment does not penetrate as deeply into the skin as the traditional tattoos you find elsewhere on the body, this in turn means that the results are not as permanent. The practitioner uses a hand-held blade rather than a machine to create the hair lines and eyebrow shape for the client. Each result will be unique, as the needs of each client can vary from one to the next. For example, some clients may require more shaping or darker pigment to create the ombre effect they desire. A numbing ointment is applied before the process begins, so discomfort and pain are minimal for the client. The blade places colour pigment into the skin, gradually going from darker at the end of the brows to a lighter shade the further inwards it gets, creating the sought after ombre effect. The colour penetrates less deeply into the layers of the skin than a regular tattoo, although the results can still last between 18 months and two years before it needs topping up again if all the after-care procedures are carefully followed. Ombre Microblading can be used to enhance your natural brows and achieve a desirable look and shape that can last years. Your practitioner uses the fine edges of the blades to mimic the appearance and direction of natural brow hairs so that a very natural but defined look can be achieved. These ‘false’ hairs fill in any unwanted gaps and will help to shape the eyebrows, so they frame your eyes and face perfectly. It’s a treatment that can transform your whole look. As the new saying goes, ‘you’re never fully dressed without your brows’ and with microblading you can feel ready to go the moment you wake up. Whether you’ve simply got very light or thin brows, or if you over-plucked your brows in the past and they are not growing back, or you are losing hair due to ageing or a medical condition, ombre microblading can create a realistic and natural look that will leave you more confident and happy with your appearance. Many of our clients come to us because they suffer hair loss from medical conditions like alopecia or facial psoriasis which can affect eyebrow hair. Such hair loss can lead to a loss of self-confidence, which ombre microblading can really help restore. By having ombre microblading, you can shorten your makeup routine and make getting ready in the morning so much quicker. Eyebrows often take up the most attention and time in a person’s makeup routine as the perfect arch can be hard to achieve every single day. You need to focus on making them appear as symmetrical as possible with the same shade and colouring. By putting too much makeup on one brow or making one longer than the other, you can throw off the whole look and often need to start right from the beginning to get it just right. If you are fed up of this dull and tiresome routine, you can undergo ombre microblading to make them appear complete and beautiful for longer – with zero effort from you each day. No longer will you have to wake up at ridiculous times in the morning to struggle with trying to get twin eyebrows. Instead, you will have a permanent brow that you are happy with that can go up to two years without needing a top up. If you decide to have your ombre microblading done with us, you will first be invited to a one-to-one consultation where you work with your practitioner to choose exactly how you want your brows to look. You will work together to select the best pigments for your colouring and which shape to go for to really enhance your natural beauty. You will then have two separate appointments spaced six weeks apart. This 6 week break in between is necessary to allow the skin time to heal. As this happens, some of the pigment may be pushed out of the skin naturally and remove some of the colour and definition of your brows. Therefore, the second appointment is used to correct any changes that have naturally occured and add more colour and shape where necessary, so your desired outcome can be achieved. After the first appointment, your brows will appear darker than they will eventually ‘settle’ as, so don’t feel concerned if the first day they are a shade or two darker than you thought they would be – once properly healed they will lighten. Many people suffer from a lack of self-love and confidence, whether this is because of the way they see their appearance or because of a medical issue. Eyebrows may seem like such a small thing to care about to others, but for some, it can make a huge difference to their self-confidence. Having the perfect ombre eyebrows is achievable with just two appointments and it could totally transform your face and make you feel so much more confident. If you want to learn more about ombre microblading and Aesthetics of Liverpool, then contact us today. We can discuss treatment options and talk you through the different types of microblading to help you decide whether or not this treatment would be suitable for you.